Thank you for your interest in St. Joseph Christian School! Each family arrives at SJCS through a variety of ways typically including; hearing about us from a friend or current SJCS family, through their church, or through an online search for a Christian school! Regardless of how you were led to our school, we are so glad you are here! The school’s purpose is to partner with Christian parents in their God-given responsibility to encourage, discipline, and instruct their children. At least one parent must be a born-again Christian, agree with our Statement of Faith and be active in a Bible-believing church. Students enrolling in Pre-K must be four years of age on or before August 1. Students enrolling in Kindergarten must be five years of age on or before August 1. The steps below outline our admissions process. Please feel free to contact the admissions office anytime during the process if you have questions. We are looking forward to helping you and thank God for leading you to our school! The best way to discover St. Joseph Christian School is to schedule a visit! SJCS has many admissions events specifically designed to introduce you to our school in person. If a private tour is what you are looking for, you may also schedule a tour with Admissions Director Cyndi King. Click on one of the below options to start your journey at SJCS! Once you have visited, had your questions answered about enrolling and are led to move forward, the next step is to complete an online application. This is necessary for all new students, Pre-K through grade 12. The new student application is conveniently online and completely secure. This process also provides parents the ability to track the status of their child’s application. To begin the Online Application process, Create an Account. Upon account creation, you will receive an email containing a verification link. Once your email address has been verified, log in to your account and Create A New Student Application for your child. You will then have the flexibility to log in and out of your account and access your open application. Your application will be considered for admission only after all required documentation and the non-refundable new student registration fee of $200 are submitted. Upon submitting the following: A completed Online Application, the non-refundable application fee, birth certificate, immunization record, necessary evaluations if applicable (diagnostic evaluation, IEP, 504 plan) and a records release for student (grade 1-12 only), your application will be reviewed, and the Admissions Office will contact you to setup a time to meet with the principal. Our secondary principal, Mr. Maggart, meets with parents and students entering 7-12 and our elementary principal, Mrs. Dunlap, meets with parents of incoming Pre-K – 6 students. This is a casual meeting providing the opportunity to get to know our new families and provides a key time for our principals to communicate our role in partnering with our families and students. This meeting will cover important information and allows time for questions to be answered! IF required by the principal for grade or class placement, testing will be set up by the Admissions Office. Typically, IF this will be needed, the principal will inform parents during the Partnership Meeting. Parents will be notified via email regarding acceptance and the next steps for enrollment by the Admissions Office. This notification will be under the subject line Enrollment at SJCS, from the Admissions Office and will arrive within a week of the Partnership Meeting or upon review of test results. Upon acceptance, families will be directed to finalize online enrollment. Families in need of financial assistance are able to apply online through FACTS within finalizing their online enrollment. Some ask if this step can be first in our process, however, it is important to go through the process as listed. Applying for financial assistance is not difficult and is encouraged for families in need of help with tuition. Upon receiving information from FACTS, our finance manager will be in touch with parents to schedule a meeting to review financial aid details. St. Joseph Christian School admits students of any race, color, national and ethnic origin to all the rights, privileges, programs, and activities generally accorded or made available to students at the school. It does not discriminate on the basis of race, color, national and ethnic origin in administration of its educational policies, scholarship and loan programs, and athletic and other school administered programs. 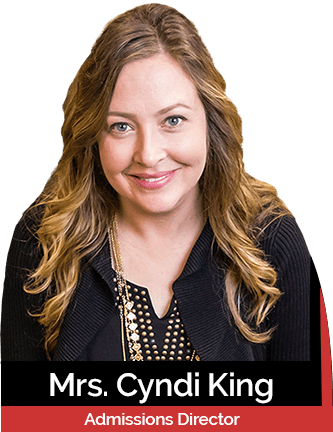 Sit down with Mrs. Cyndi King after your tour to learn more about SJCS.